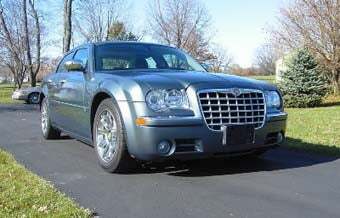 Nice Pipe Or Crack Pipe: Barack Obama's Hemi-Powered 300C For $100,000? Yesterday's low-mile Mazda RX-4 got our highest Nice Price Or Crack Pipe approval rating yet, with a landslide 78% of voters going with Nice Price. Today we're going to ask a question we haven't asked here since the Tin Man's Fleetwood: how much extra does fame add to a car's value? Kelley says a regular one is worth around $16,000, but Mr. Obama is definitely a non-lightweight famous person; in fact, the Obama's 300C website points out that a waffle half-eaten by Obama sold for $20,000, and the owner of a Barack-played pool table is shooting for a half million dollars. We'd feel a lot better about the price if the seller had some photographs of Obama actually driving it, and an authentic Barack Burnout video would make this a slam-dunk Nice Price. As it stands, though: $100,000 for this? [eBay Motors], thanks to Bill for the tip.